Sonata for clarinet and piano no.1 in F minor, op.120, no.1 (1894) [24:40]; Sonata for clarinet and piano no.2 in E-flat major, op.120, no.2 (1894) [22:10]. Brahms and Schumann are composers eminently suited to pairing on disc. 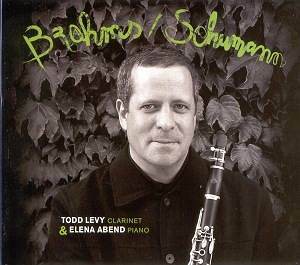 Todd Levy, principal clarinettist of the Milwaukee Symphony Orchestra, and his accompanist Elena Abend � both new to me � are artists well suited to the temperament of both composers. From the outset of Brahms� first sonata a spacious view is taken, despite the marking Allegro appassionato. Indeed they realise the contrasts between the sections of the movement remarkably well, proving in the process that appassionato does not have to mean over the top or overtly forceful. Their realisation is that passion comes in waves; rightly so, as this allows for the sense of space and reflection that the more inward passages contain to make the more outwardly passionate ones carry the weight of their emotional impact. In a twist to the perhaps expected movement-ending Brahms concludes on a thoughtful diminuendo, the questioning aspect of which both players capture. The second movement continues in a similar vein, and, as before, a sense of musical partnership rather than mere accompaniment is palpable. So too is the carefully wrought tone of both instruments, where particularly the clarinet�s lower register is played to hang in the air effectively as the tonal line progresses through a characteristically Brahmsian microstructure of modulated triads. The tempo is picked up in the third movement and a sense of fluidity is shown in the playing to echo the apparent ease of composition. All of Brahms� innate sense of structure and pacing is to found in his late chamber works, almost to a greater degree than elsewhere in his output, and this performance makes you aware of a very lyrical composer working at full flood. The final movement carries overtones of folk influences, as well as projecting a notably more optimistic voice. Indeed this is an apt thought as more than once Levy�s clarinet takes on a near-vocal quality to telling effect. All in all the difference in mood that is apparent between the two sonatas could not be more pronounced. Whilst the second could be described as shaded, maybe even guarded and insular for the most part - it followed closely after a series of personal setbacks for the composer - the second sonata�s three movements present an amiable face to the world. In his notes Stephen Pettitt comments on the �salon-style opening� of the first movement � and there is something of this that comes through in the atmosphere of the recording, with both instruments at a slight distance. Though cleanly captured, they sound as if caught in an amply dimensioned drawing room. Abend�s touch as pianist is sure, whilst Levy�s approach belies a performer of purpose who puts the composer first among his concerns. The comparatively complex textures of the middle movement come across well, by dint of careful phrasing, before leading to the variation-based finale within which much is left implied by composer and players. The Schumann compositions here are both more compact in form and subtly different in mood from the Brahms sonatas. Their character is more wistful, particularly in the Fantasy Pieces, and the Romances are cast with much sense of mood about them. If my preference is for an element of wonderment that creeps into the Fantasy Pieces, it is due in large measure to the careful yet not over-studied phrasing with which they are played. That said, I found the tonal colouring brought to bear within the Romances effective in providing elements of suggestion. These factors, along with a strong lyrical gift, are perhaps what the two composers have most in common, and it is right that Levy and Abend allow such elements to exist unhurried and unforced in their performances. Most warmly recommended.